Our payments feature integrates with Stripe.com, allowing you to collect payments or donations from entrants to your campaigns. In addition, you can use this to set up a form to sell products, pay for bookings, sell event tickets, and more. ViralSweep provides this payments feature to allow you to collect payments from entrants to your campaigns. However, most states and countries have variations in their laws and regulations regarding payments when it comes to sweepstakes and contests. ViralSweep assumes no responsibility for whether you are in compliance with the law. You understand that it is your responsibility to ensure that your official rules comply with the rules and regulations of your locality, including offering a free alternate method of entry where applicable. ViralSweep reserves the right at anytime to remove the payments feature from your account. If your company is an approved 501(c)(3) you may be permitted to use our payments feature to run a raffle or to collect donations. If you are running a contest such as an essay contest, you may be permitted to require an entry fee. Sweepstakes are "no purchase necessary" promotions, which means you cannot require a user to make a purchase to enter. However, if your sweepstakes offers an alternate method of entry (AMOE), then you may be permitted to have users make a purchase to enter. Use our email collection app to build a simple form and collect payments through that form to sell products, tickets, ebooks, and more. 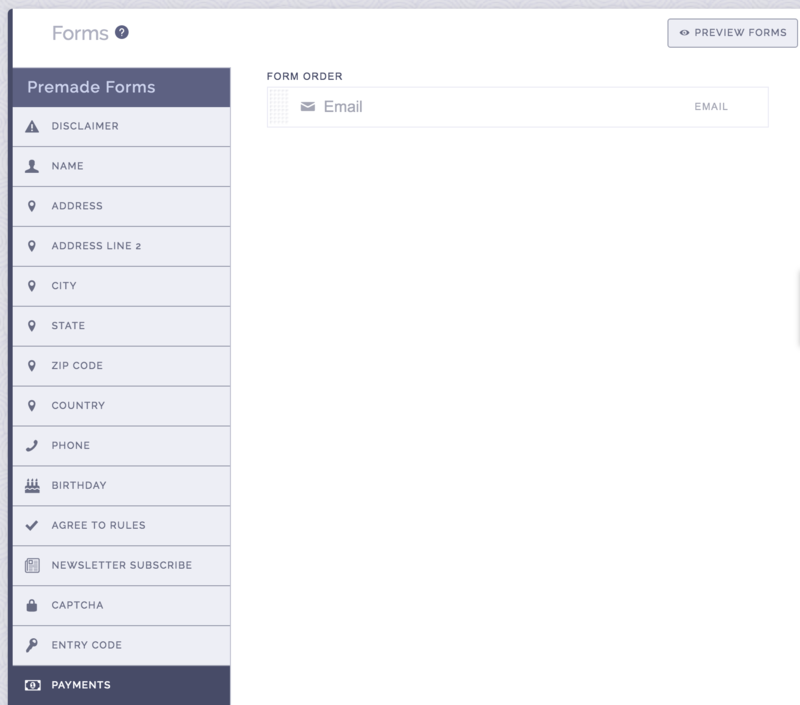 When building your campaign, click the Payments button in the forms section. Agree to the disclaimer and the field will be added to your form. You will need a Stripe.com account in order to use this feature. Once you have a Stripe account set up, login to it and go to Developers > API Keys. You have the option of grabbing your live API keys, or you can grab your test API keys if you want to run test payments first. Copy your Publishable Key and your Secret Key and paste those into the fields in ViralSweep. Next, choose if you want to save a customers card and manually charge them later. 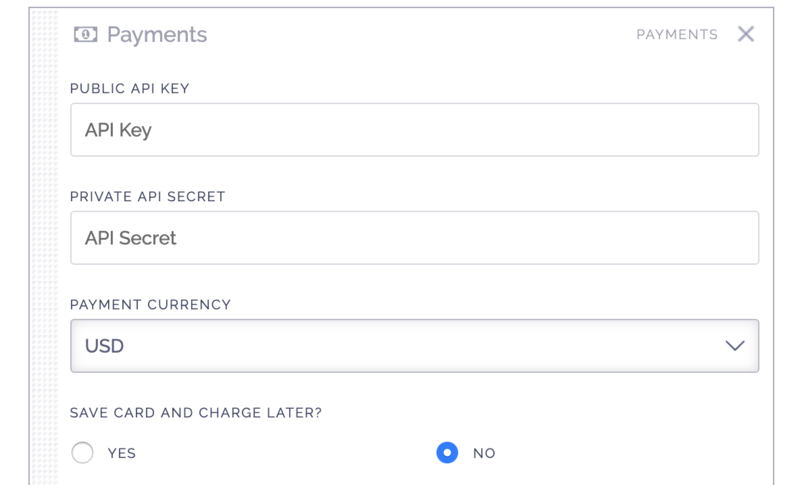 This will allow people to complete your form without being charged, and their card information will be stored in Stripe so you can manually bill them later on. If you do not want this option, select no. 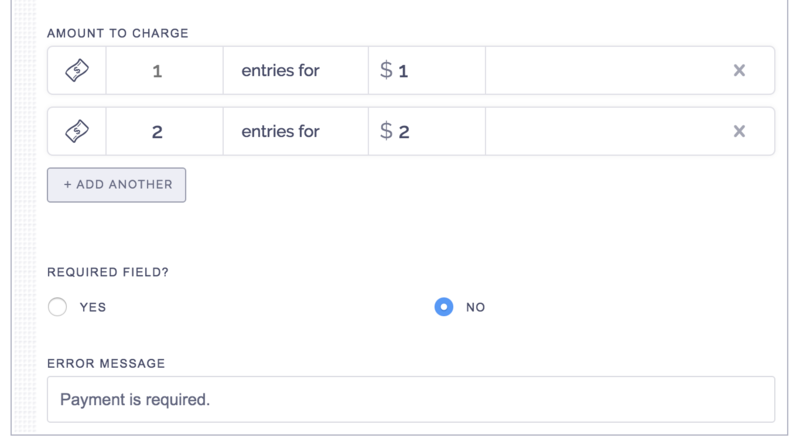 You can now configure what the field labels will say, how many payment options you want to have (and how many entries the user gets for each) and if the field should be required or not. You can now collect payments through your form. If you want to test this, be sure to input your Stripe test keys, then you can try entering and using the card number 4242 4242 4242 4242 to simulate a real card. Don't forget to swap out your test keys for your live keys when you're ready to collect payments. You can also run a live test on our demo below. I am trying to test a payment but nothing happens when I click enter. If a payment form does not appear when you click enter, check that your Stripe keys are correct. How do I track who paid? You can see the total number of entries each entrant has within your dashboard. In addition, you can click the + icon next to each entrant to see what they had paid. How can I sell something without awarding entries? By defualt, we ask you to input a dollar amount and the number of entries you want the system to award someone with for making a purchase. If you want to sell tickets or products, simply put any number in the box for entries, and turn on the Redirect Upon Entry feature to forward the user to your own thank you page after they complete the form and make their purchase. Still having trouble with our payments feature? Simply click the support or live chat icon to get in touch with us.